Home Costs > How Much Do Concrete Steps Cost? How Much Do Concrete Steps Cost? Concrete stairs are often a popular choice for exterior stairs for both residential and business purposes. Being a durable choice, concrete can be ideal for a location that either sees heavy use, such as the front steps of a home, and/or is exposed to harsh weather. The costs of concrete steps will greatly depend on the size of the job, the access to the project site and the contractor who you hire. From our research online, the average cost will be about $300 to $500 per three to four-foot wide simple step to be installed professionally. While concrete, as a material, is cheaper than stone, it will be more expensive due to the time it takes to install. This estimate should include the lumber framing, plywood, concrete and contractor fees. 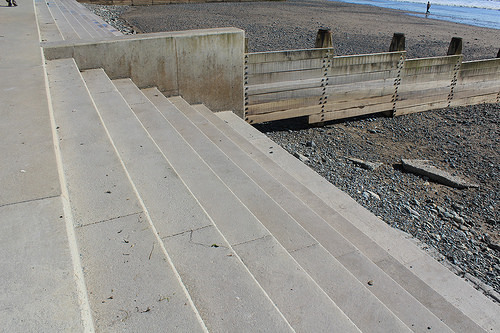 Precast/prefabricated concrete steps or steps with a dramatic style can cost up to 200 percent more. Depending on the size, a one-piece step, without any professional help, can cost anywhere from as little as $170 to more than $750, excluding shipping. PrecastStep.com, for instance, breaks down the sizes and costs on its official pricing sheet. For example, TheSpruce.com talked with a contractor who specialized in concrete steps and he noted you should be prepared to spend about $300 a step. On this forum thread at BiggerPockets.com, one member was quoted $1,500 to remove and replace his concrete steps. This quote, according to his description, was for a landing with about three to four stairs and a simple concrete landing. According to the responses, as long as the contractor was licensed and insured, it seemed like a good quote. A member of Angie’s List stated they were getting quotes which ranged from $300 to $600 for a repair to as much as $1,200 to $2,200 for a full replacement. The process, as long as no obstacles are present, will begin by excavating to lay the groundwork for the concrete steps. According to the contractor interviewed via our source prior on TheSpruce, these steps should be at least six to eight inches in the ground, but if you live in a colder climate, some contractors may dig as deep as 20 inches. Next, pieces of wood, which is usually pine, will be used to create a rectangular box in order to create the step shape before laying the concrete. Leaving the backside open, the box will be driven into the ground where each step will be created and rebar, depending on the size of the step, will also be installed for added support. Working from the bottom of the box to the top, contractors will use what is known as a monolithic pour to time the concrete as it fills the wooden box that was created. Once the tops are smooth, the wooden box will strategically be removed once the concrete is dry enough. On average, according to contractors, it can take up to two full days to install an average set of concrete steps. Depending on the weather conditions, it can take up to 24 hours to walk on it. The estimates mentioned prior are for the install only. If you had existing steps that had to be removed and replaced, then this could increase the costs by more than 30 to 40 percent, according to the quotes we researched online. Concrete, being one of the many options when it comes to landscaping steps, should be compared to other material choices. Stone, for example, can be up to 50 percent less, even when a professional is hired, but it can be weaker as a choice. If choosing a professional landscaper, be sure to talk with them to see what your options are to fit your budget. As with any job which requires a contractor, we highly recommend you get as many quotes as possible to make an informed decision. If you do not know where to start, consider gathering multiple quotes for free at HomeAdvisor.com. Here, you can simply describe your project and contractors will contact you with a ballpark estimate for free. Depending on the condition, in some circumstances, the stairs may be able to be replaced for a fraction of the cost. However, if the steps are in poor condition, then it will be much cheaper to replace rather than repair.